Spain – Fiestas, bullfights, Flamenco dancing and most fortunately for us, a hotbed of inspiration for your Spanish picnic menu. The economy might not be the greatest at the moment. But there is so much to admire about the historical, rich, Spanish culture. All this lends itself perfectly to conjuring up your own Spanish picnic recipes, whether it be the beautiful tapas on offer throughout the country or by giving their extraordinarily good gaucha sauce your own little twist. 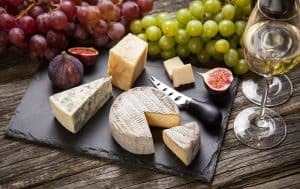 Below, please find a smattering of suggestions that we love about Spanish cuisine that you can use in your picnic basket. You simply cannot write about Spanish food without mentioning tapas. This legend of Spain is everywhere you look whilst on your travels. 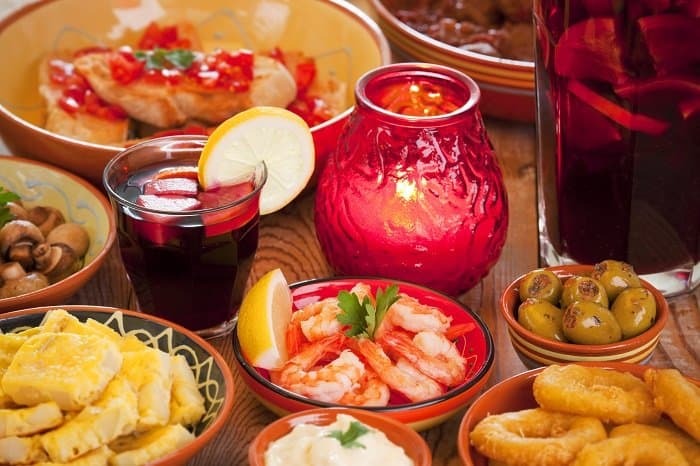 From street vendors to bars and restaurants, you will even find tapas on roadsides of the highway. The amazing thing about tapas is it relates to almost anything you can think of food wise. As long as you serve it in a bitesize portion you can get away with calling most things tapas. This means hot food, cold food, soups, sea food, a bowl of olives, some fries, even a micro salad. The list is virtually endless. 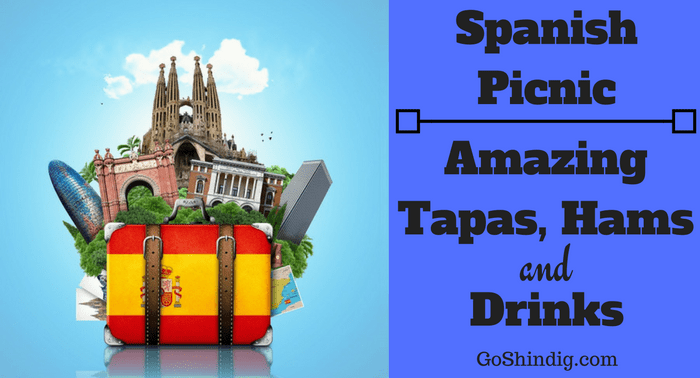 Some of my favorite times whilst experiencing Spain for a number of years were spent in some of the many tapas bars around my area and hopefully, I can share with you some of my most beloved dishes that you can use in your Spanish picnic. Bacon con Gambas – Served to me in just one particular bar in southern Spain, this snack from the Gods always had me coming back for more and would be a great addition to your picnic. Served hot but equally nice cold, this dish comprised of a shrimp wrapped in bacon, skewered with a toothpick and deep fried. The juiciness of the shrimp combined with the saltiness of the bacon was heavenly. Chicharrones – Look, this is controversial as these are definitely best eaten straight from the fryer but they are so tasty I couldn’t leave them out. It’s not unheard of taking some mini picnic grills along with you so I say chicharrones can stay! 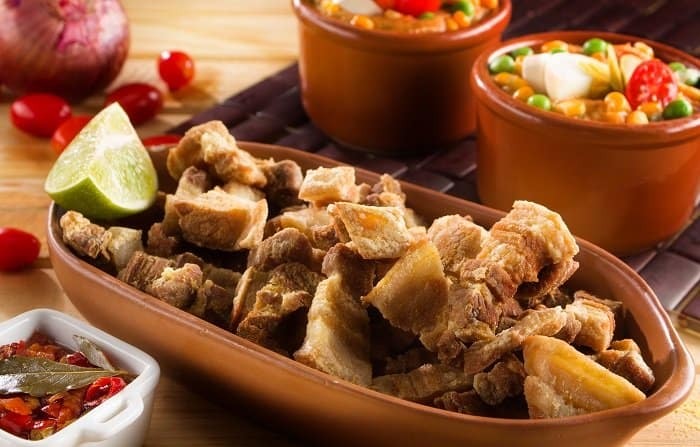 Made by rendering down belly pork and frying it in its own fat, chicharrones call out to your most primal thoughts. Get them right (crispy fat yet still with a bit of moisture in them for the taste explosion) and there is surely nothing better in this world. Unless you have a great butcher I suggest making your own. Olives – Simple enough you might think, especially with the opening gambits on offer and you’d be correct. BUT. There’s a big difference between a good and a bad olive. To be honest I was never a fan until I was offered a free small dish with the beer I had ordered in Spain. I tentatively put it on the end of my fork and began to chew. I’m not going to go all hyperbolic on you but it was a great deal better than any olive I tried before. The secret I learned was simple enough. Type of olive and its subsequent storage. I fully recommend Gordal olives if you have not tried them before. Big, bolshy things full of flavor. If left open in a cool place for a day or two before eating the flavor will be enhanced. Morcilla – Not your typical picnic item I know but who wants cliché? Morcilla differs from blood/black pudding by using onions or rice instead of oatmeal or pine nuts. And then there’s the star of the show, the pig’s blood. Sounds disgusting right? Wrong! I implore you to try it no matter how rank it sounds. Trust me, I was just like you. Morcilla can easily feature in your Spanish picnic, hot or cold. I like to spread it on a buttered, crusty slice of bread. The rich, iron taste you get from Morcilla will certainly leave a lasting impression on your palate. My suggestion is to make smaller pieces and shallow fry until crispy all over. 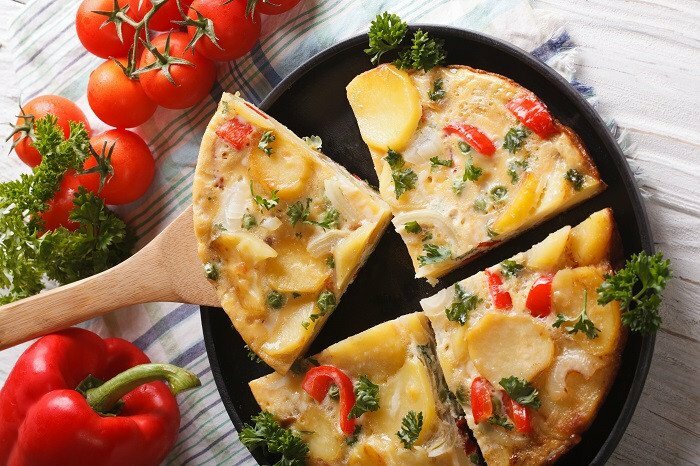 Tortilla – A Spanish tortilla actually refers to an omelet made with potatoes. It is such good picnic fare as it is highly adaptable. I love to add bell peppers, chillis and even a bit of salmon. It is an absolute breeze to make, store and dispense meaning less stress, meaning a much smoother running picnic. Jamon Iberico – This is always the most expensive thing on the menu but the one my friends and I always choose without fail. It could be served as a tapa, media racion or a racion and you get no points for guessing which we chose. There are a lot of jamons available when you eat tapas but let me make it clear, I am talking solely about Iberico de bellota. Pure bred Iberico pigs fed only on acorns, Iberico de bellota instantly makes you feel all is good with the world. Biting into a razor thin slice, you first get the saltiness that comes from the dark meat. As that melts away in your mouth though you experience the longevity of flavor through the fat that remains. Chewing on this extends flavor experience by a long while. Jamon is perfect for your Spanish picnic as it can be pre sliced, just make sure you have a good stand and an extremely sharp knife. To find the correct slicing technique please have a look at the video below. If you are unsure whether Jamon Iberico is for you then there are always pre packaged alternatives that you can try. Aioli – I came across this delight when I had it placed next to a bowl of fries I had ordered. Made from garlic, olive oil, eggs and salt it could initially be mistaken for mayonnaise. One bite will tell you this is not so, however. 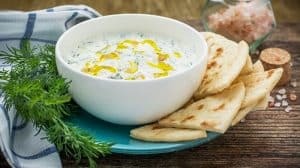 The almost overpowering whack of garlic is delightful and the creamy texture it provides means it is a great addition to raw veg, olives, bread amongst a few. Gaucha – Served to me to accompany my Secreto Iberico, I instantly fell in love. It reminds me of an extremely tame mustard but with smokiness and creaminess. Currently, I’ve been using Gaucha as a dip for my chips. 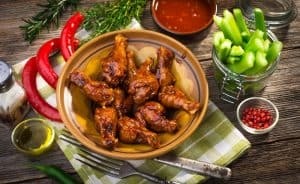 I like to add just a little bit of hot sauce but equally, you could add mustard, black pepper or garlic paste should you so choose. It really is a diverse sauce. Making it yourself is good but if you can find any Ybarra Gaucha sauce I wholeheartedly advise that you try some. Flan – Personally not one of my favorites but it is a dish you spot everywhere you go in Spain. It’s essentially a crème caramel made from condensed milk, evaporated milk, egg yolks, and vanilla. Flans can be as small or large as you desire meaning storage is not an issue in your picnic basket. Churros – Mostly eaten for breakfast in a similar fashion to the French eating pain au chocolats, Churros are better off served as a dessert in my eyes. Deep fried choux pastry sprinkled with lashings of sugar and dipped in melted chocolate is the only way these should be attempted. Sangria – Whilst feasting on the above veritable banquet, you are no doubt going to need some refreshments. And excuse me for being slightly stereotypical but the only Spanish drink for me is sangria. Everyone has their own take on Sangria. But I’m here to let you know there are only TWO secret ingredients you all need to be aware of. Trust me, I worked bars in Spain for a number of years! Along with your red wine, chopped fruit, soda etc please make sure to add some Tio Pepe sherry. The most important ingredient, however, is banana liqueur. 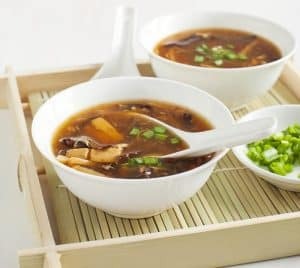 Experiment with measurements to get it right for you but honestly, with these two ingredients, you will not go wrong!! 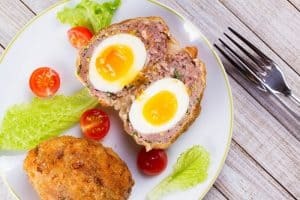 British PicnicAll the classic recipes that are enjoyed throughout the UK, including these very tasty eggs. Chinese PicnicFor the adventurous picnic goer. This menu is both challenging and rewarding if you get it right. French PicnicWhen you think of great food this is definitely one of the nations that pops straight to mind. 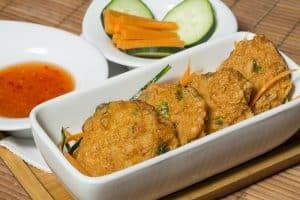 Fine cuisine is what they do best and there are many dishes you can easily add to your picnic basket. 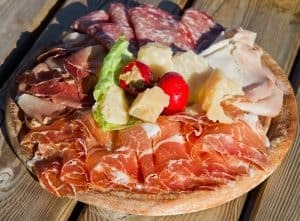 Italian PicnicPizza and pasta are probably the first things you think about with Italian food, but there is so much more to enjoy. Mexican PicnicFood with a hot punch. Everyone has a family favorite dish, so why not extend your love of this food to outdoor entertaining at a picnic. Thai PicnicWith some of the worlds best sauces and dips it makes sense to have this country as a go to picnic theme.